Unlike his erratic father, his moods are quite even - one might even call him apathetic. He is not impressed easily and despite the fact that there is a certain pull in his blood (the ever whispering Northern wind in his heart, telling him he is born a wanderer) he has a tendency to stick around. If he is restless in nature he has an excellent way of hiding it: being capable of sitting motionless for hours, not being distracted by a single thing. There are times that his soul feels a thousand years old, but it is something he can deal with quite well - most of the time. Especially when there is no bird god to pull at his veins and bewitch his mind. Although he can be kind, in most situation he doesn’t feel anything at all. The most notable exception in his life is the love he carries for his little niece Wolf and the orphan girl Dille. When it comes to them, there is no bridge he would not cross - or burn. Dille is the one who holds him safe, keeps his nightmares at bay and fills his world with light and rainbows. Wolf is the soft and quiet hand at night, who is always reaching for his fingers to hold - to show him there is great beauty to be found in even the darkest of dreams. They are flip sides of the same coin; both angels in their own right. Side activities In the city he serves the rich and the royal, including the emperor and his wife. During the night he walks through the kind of wonderland that his Lord and mistress happily would burn into ground, while courting this same empress during the day. Hobbies Azar is a graffiti artist: the dreams he has visited, he paints on the walls of the city. The graffiti is his way to give something back to the world. Wanderer between Worlds People can go to 'Jack's Dreamland' through an addition that Azar adds to the opium he sells. Of course, most people he will never share this with. But people like his niece, which is as a sister to him, and her friend, he will gladly over his services. In Jack's Dreamland you are a creation of your own thoughts and wishes - and of course, just a little bit of magic. Meaning that Wolf suddenly can see during the day and her friend Fawn has small antlers. Azar, beautiful, cunning Azar is not that different at all. No matter which world you will put him in, he is nothing but a sly devil in disguise. Dreameater Cannot dream himself, so visits and feeds on the dreams of others. Gained and keeps his immortality through those dreams. Taking a bit of the imagination (or perhaps: life) away of others. Didn’t knew in his youth he was stealing this, and has a deep rooted sense of guilt over it (feeling of justice from E’ves), but can’t stop doing it. On bad days he doesn’t sleep, and does not need to sleep either. The dreams he has visited he paints on the walls of the city, in all kind of colours. People (mostly children, because their dreams have much more to offer) whose dreams he has visited remember him by poppies. They don’t exactly remember his presence, but they do recognise the poppies, and they all agree on that. After that there is usually a terrifying blackness and they wake up from a nightmare. Creator of DreamsDuring one of his nightly strolls he slowly came face to face with an other one of his powers. He would later describe this as 'What I have dreamt, I can create - as long as it draws breath'. His first creation was a couple of black kittens. On first sight they looked quite normal: shining coats and bright eyes. However, when one would pay more attention they would notice their appearance was always a bit 'off'. Their eyes shone a little too bright, they moved a little too fast or the shade of their coats was just not right. A little too green, or a bit of blue where only black was in order. Sometimes they didn't seem real at all: being there and not there at all. Like a shape derived from dreams, but that was - after all - exactly what they were. Of course his niece loved them, unearthly and shape shifting included. At least they were real in the sense that others could see them too. Grown up with his niece Elena Wolf underneath the good care of his aunt Nachtschade Donoghue. In many ways being as different from the world as the young Wolf was, they developed a strong bound that could put many siblings to shame. Although the way Wolf was haunted was a lot more visible to the outer world, Azar has battled enough demons of his own. Some beautiful and tempting, others leaving him heartbroken and scattered. One of the demons he found to battle was the power that made him immortal. For, as he found out, he ate the dreams of other children, and turned that magic into immortality that ran into his veins. It was not a that would kill in it's essence, but it left the children waking from a void that threatened to consume them. It could be enough for lesser men to take their own lives. And as the void consumed the minds of the children whose dreams he visited, it consumed him in the same way. It was not a matter of a conscious decision he could make: he did not have the choice to stay away. If he slept, he dreamt, and in his dreams he would visite the dreams of others - and take them away, turning them to the magic that ruled in his veins. Thus he started to do the only thing he could do: staying awake. Developing a severe cause of insomnia, Azar spent most of his nights doing everything that would keep him from falling asleep. Since Wolf usually slept during the day, he would take her out for long-night-strolls and other night-time-adventures. ♀ Wolf is a pretty little thing, but quite hunted by her schizophrenia disorder. Most of the time she is this lovely little lady talking to her imaginary friends, but she can have extreme and violent outbursts that can even scare grown man into retreat. The Floreale Estate is probably her favourite place in the world; her two cats company of choice. ♂ Born as human, raised himself through the ages to the status of half-god. Considered to be immortal. Son of wanderers, and no stranger to the world himself. Grew up in a warm and loving family. Dreamed of flying before he could walk. Almost killed himself, several times, by trying to make this dream come true. When he could walk, he wandered off constantly, into the plains, the forests, and old villages. Got lost multiple times, but got never discouraged. Roamed the world ever since his early teens. Fathered at least five children by three different people. Had multiple lovers, men as well as women. Probably has some kind of multiple personality disorder causing his very erratic behaviour. Is however, always true to his true self. Whatever that may be. Spends now most his time working on a ranch, annoying a certain cowboy. Until he will soar on the wind to some other place and time. Dille fiancée Total fool when it comes to her. Buries her in oceans of poppies because he has no idea of how to handle his love for her otherwise. Evan & Flight fathers No one said it would be easy, now did they? Nachtschade surrogate mum She was the one to take him in when both of his fathers bailed. Under her care he has fallen in love with her other children. There is nothing he would not do to keep them safe. Home & Heart Despite being the (biological) son of two fathers (E'vesdar and Fingall), Azar has always been raised and shaped by the women in his life. E'vesdar sister, Nachtschade was the one to take him when both of his fathers bailed. Under her care he has fallen in love with her other beautiful children: Wolf Elena and Madelief. There is nothing he would not do to keep his little sisters save. Not only E'ves's sister played an important roll in his life. So did Fingall's: Ren. When he thought he couldn't go on anymore, she picked him up from the street and gave him a purpose - a way to be capable of living with himself again. She helped him to gain control over his powers and channel them in an useful way. Together they set up the establishment that would become one of the most notorious places to go in both the South and the North. ’Marry me,’ he said Dille is not necessarily the love of his life. It is more like she is the love of his eternal and undying soul; like they are made from the same pieces of stardust and he will attracted by her no matter what shapes their bodies hold. He wants to be the one to hold her hands when they are in need of holding, the one to kiss her lips when they are yearning for kisses. He wants to be the one to hold her, caress her, when she is even in the slightest need for attention. He wants to whisper all the kindest and most beautiful of words. He wants to dream her the universe and shape all those astonishing gifts no mortal soul can come up with. When it comes to her, he simply wants to cloth her in all of his poppies, because there is no other reasonable way he can deal with the love he holds for her. Flight / E’ves One or two scenes in which he meets one of his fathers. Flight perhaps walking in on him and Dille, being all agitated like only Flight can be. The scene with E’ves is definitely softer / quieter in nature. Perhaps Azar looks him up (at his farm) instead of the other way around. first meeting with Cameron Cameron catching him in the city, somewhere, when Azar is making one drawing or another with his graffiti. Cameron asking him if he doesn’t use red, and Azar replying he doesn’t like red as a colour. Azar is one of the three characters I created in a very short time period and fell in love with immediately (the other two are Deimos and Devaki). For me, he just ‘clicked’ into place; everything about him felt just right. At some point I realised he is probably more like me than any of my other characters. While they all inherit some of me, it is usually in extremes, or very specific parts. Azar is more balanced, more like a reflection in some kind of fantasy-mirror: if I were to have any magical powers, if I were to be a man in other world, I could have been him. alimarije designed a lot of my characters in one way or another. But from all the designs she did, Azar is by far my most precious one. He is absolutely stunning in every aspect and so much to my tastes I can’t possibly put it in words. I love how he is both dark and glowing, and has inherited traits from both his parents. The first time I saw him, I wanted him, and I am ever deeply pleased he is mine. Dille. I can’t possibly gather up 10 facts, without including this pretty girl. In my experience shipping characters sometimes works, and sometimes it doesn’t (no matter how you try to wish it into existence). Dille and Azar is simply a match made in heaven. They just clicked. If something like ‘love at first’ exists in the writing world, that is (for me) what happened between them. From day to day Azar is rather in control of his emotions, but when it comes to her, it is like a certain door gets unlocked and everything pours out. He. Loves. Her. With everything he is, and every fiber of his being. With most things I write, they happen to be flexible. Sometimes 1+1=2, and sometimes it equals 4, or 6. This is not one of these things. He loves her. That’s all there is to it. 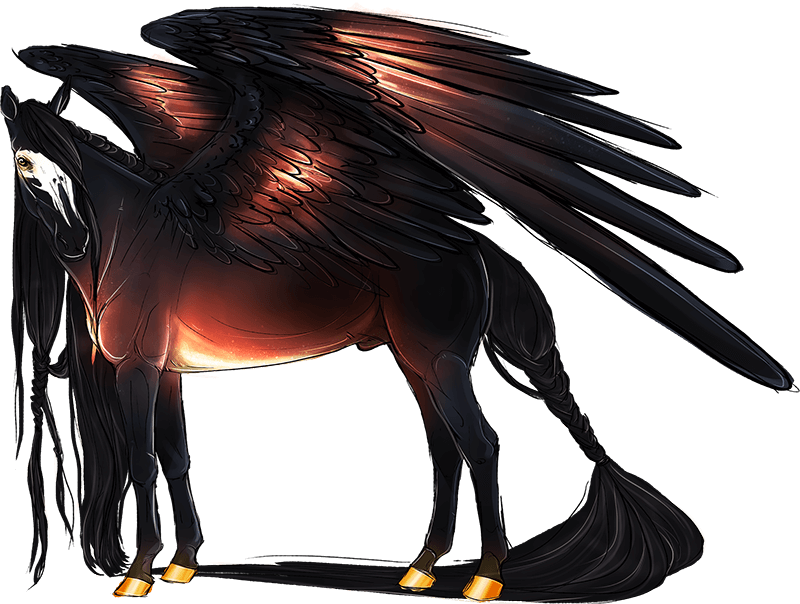 Azar is the biological son of two fathers (E’vesdar and Flight), called into live by the powers of a god of another world. Blessed by this god with a touch of immortality, his life energy is fed by the dreams of others. The price he pays for this is high, as the dreamer wakes in terror from the dreams visited by Azar. He leaves a void, a dark and infinite nothingness, in every dream he touches - which he finds to be unforgiving, especially in the case of children’s dreams. Knowing he cannot sleep without visiting, he never sleeps around Dille, determined not to inflict that pain upon someone he loves. Being haunted by monsters far more terrifying than the void he brings, his niece Wolfsmelk is perhaps the only person Azar knows that can meet him in his own darkness and comfort him there. Innocent and fearless as she is, despite being much younger, she is always there to hold his hand and share his dreams. He does not bother her with real world problems, but instead finds comfort in her faith that you can be both be haunted by demons and still find happiness and joy in your everyday life. He extracts opium and morphine from poppies, which he sells to people who think they can escape their real life problems by spending their time dreaming. Azar welcomes them in his underground establishment and feeds upon their dreams. He knows that, in almost all cases, these people end up addicted and broke - their lives in ruins -, but he simply does not care. He holds little regard for people that wish to run from reality in this way, and he is not below providing them with the means to do so. He rather feeds on their dreams, leaves them in terror (in the full knowledge they will keep using the opium and keep returning to this darkness) than preying on the dreams of the innocent. Due to his powers Azar tends to distance himself from others. He comes across as calm and in control of his emotions, perhaps apathetic even. Important exceptions are his love for Dille, his protective attitude towards Wolfsmelk, and the dark streak he carries towards his opium-customers. He can be rather cynical and hard in his judgements, but usually tends towards giving people the benefit of the doubt. If not for anything else, then just because his soul feels a thousand years old and he is simply to tired to give a damn. Although he feels restless by nature, and he can wander through the forest and mountains for hours, Azar is not much of a traveler. Despite feeling rootless at times, he prefers to stay close to home and feels most comfortable in the places he build for himself. Azar is capable of creating objects he dreamt about. Although he tries to refrain from using these powers, he can’t keep himself from creating flowers for the two girls he loves. One of the first things he created with these powers is a couple of black kittens for Wolfsmelk (Hypnos and Morpheus). Like everything created in this way, they look normal enough at first sight, but the longer you look the more you will realise there is something weird about them. They are not exactly black (but sometimes seem to flash a bit blue or purple instead), or they move just a little bit too fast, or perhaps you thought they were there, and then they are not. Of course, Wolfsmelk doesn’t seem to notice all these things, and if she does, she does not care: she loves those little rascals all the same. Azar has a gift for accepting (most) things for the way they are. He does not carry resent towards his parents for leaving him to be raised with his aunt Nachtschade; and he enjoys every visit he makes to Eves’ ranch. He does not see any trouble in Wolfsmelk, were others take pity on her, and least of all he is bothered by the fact he can love one so deeply as he loves Dille. If he only could be as forgiving for his own powers. Life and Death have been in Love for longer than we have words to describe. Life sends countless gifts to Death and Deaths Keeps them forever. To see a World in a Grain of Sand and a Heaven in a Wild Flower. Hold Infinity in the palm of your hand and Eternity in an hour. I love you. When did I start to love you so much?